Next to the dairy, bread, and canned vegetables aisles at a US supermarket is the frozen Hispanic section. Inspired by Hispanic cooking the aisle contains produce such as arepa, empanadas and tamales. 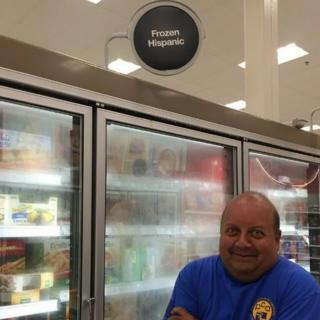 So when Paige Alban's dad, who is Hispanic, came across the frozen Hispanic aisle, and we presume felt a little chilly, he thought it would be amusing to pose for a picture as a frozen Hispanic. Since Paige's image of her dad was tweeted, other social media users inspired by Mr Alban have responded by sharing their own cold snaps. One Twitter user shared what a frozen Hispanic person may look like. While another posted a meme of a man wearing a sombrero coming out of a fridge. The US census bureau states that as of July 2014 there were 55 million Hispanics living in the US. It defines Hispanic as a person of Cuban, Mexican, Puerto Rican, South or Central American or other Spanish culture regardless of race. Goods labelled as specific to a community is now a common sight in many supermarkets, as they drive to cater for multicultural communities. But some may question why there is a need to isolate such products in a country where dishes such as tacos and burritos are commonplace. Although most social media users found the pictures amusing, one twitter user had a more serious point to raise about the frozen Hispanic sign. In response to Mr Alban's image, the user posted: "Casual racism made cute". But other social media users were happy to be part of the joke.